SIRIUS 3RQ3 Coupling Relays come into their own when standard controllers with their inputs and outputs reach their limits. Whether they are used for isolation or the transmission of signals from one circuit to another, coupling relays also contribute to controller overvoltage protection. Anywhere controllers are used – whether in factory or process automation applications – coupling relays add real added-value. The SIRIUS 3RQ3 coupling relays should be your first choice when it comes to isolating circuits, converting voltage levels or amplifying control signals. With a width of just 6.2 mm and a low overall depth and height, they are ideally suited for installation in control cabinets with tight space requirements resulting from narrow tier spacing or in flat switchboxes. SIRIUS 3RQ3 coupling relays feature a slim, compact design with semiconductor output. 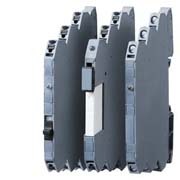 SIRIUS 3RQ3 coupling relays can be wired simply and efficiently and offer screw-type and spring-loaded terminals (push-in technology) as well as an integrated jumper option for all potentials.